Using words to connect with our world is something we humans do all the time. Sometimes these words are directed at people or animals, and sometimes they are sent out into the universe with the hope that someone or something can hear what we are saying. In today's poetry title you will encounter some poems that will resonate with anyone who has, among other things, asked for courage, who has lost something, who has lost someone, and who has felt regretful. We humans have been using words “to try to influence the world around us” for centuries. We have offered up prayers and chants to ask for kinder weather, to secure safe passage on journeys, and to be victorious in battle. We have sung songs to get the attention of our one true love, and to bless our sleepy children before they slumber. We now know that songs and chants cannot save us from tornadoes, make our crops grow and protect us from the newest wave of the flu, and yet we still write down words that are essentially chants, charms or blessings, some of which are offered up in prayer or song. The creation of these offerings helps us to celebrate, to grieve and to process our anger. They allow us to communicate our feelings to the universe, and to even gain an understanding about ourselves in the process. In this remarkable book Joyce Sidman offers us poems that will give readers much to think about. She begins with Chants and Charms: to bolster courage and guard against evil. Here readers will find a chant to help repair a friendship, one in which the writer asks the reader to “forgive the past” and to give love, which “is vast,” a chance. The form of the chant is beautifully lyrical. This is a remarkable book full of poems that are rich with beauty and wisdom, and readers will want to read than again and again. Picture Book Monday with a review of Any Questions? Many children's book authors and illustrators visit schools, and when they do the eager students often ask a lot of questions. One of the most commonly asked questions is some version of "Where do your stories come from?" In today's picture book this question is answered in a clever and often amusing way. A story always starts with a blank page. If you stare at the page long enough, “anything can happen.” You might think that a blank piece of white paper cannot possibly inspire anything, but this is not true. For example, it can give birth to a scene that is full of a snowstorm. If you start with a piece of paper that is old looking and has a yellow tinge to it then you might end up telling a story about a time when dinosaurs walked the earth. Blue paper can lead to an underwater adventure and green paper can be the backdrop for a story about a jungle. Sometimes stories don’t start with a color at all. Instead, “words or ideas” come “floating out of nowhere.” Bit by bit pieces of paper with words and thoughts written on them are collected and sorted, and then they are joined by “little scribbles and doodles,” which is when the kernel of a story starts to grow. Of course, sometimes an idea pops up on the page that simply does not work at all. When this happens an author has to search around for something that does work, which can take a little (or even a lot) of time to happen. These things cannot be rushed though, and eventually the right piece of story comes along and the author is off and running. In this wonderful picture book, Marie-Louise Gay explores the writing process, answering questions that children have asked her over the years. She shows us how a story is built, how it unfolds, and we see, right there on the pages, how she creates a magical story out of doddles, scraps of ideas, and tidbits of inspiration. The little children and animals characters who appear on the pages interact with the story, questioning, advising, and offering up ideas. This is a book that writers of all ages will love. It is funny, cleverly presented, and it gives writers encouragement and support. Telling stories using poetry is something that poets have been doing for a long time. Often the stories are made up, but sometimes that are based on real events that took place in the past. In today's poetry title readers will find a collection of poems that are used to tell the story of the United States. Picture Book Monday with a review of Where's Mommy? Children love to have secrets and in the book Mary and the Mouse, the Mouse and Mary we meet a little girl and a little mouse who have a secret. They become friends and knowing full well that their families would not approve of their friendship, they keep their times together a secret. In today's book you will meet Mouse Mouse and Mary again, and this time you will see that they are not the only ones in their house who have secrets. Mary is a little girl who lives in a lovely house, and Mouse Mouse is little mouse girl who lives beneath the floorboards of this house. Mary knows all about Mouse Mouse because she and the little mouse are friends. The girls know better than to tell their families about their friendship. The human parents would get a cat, and the mouse parents would “flee to a hole in the ground.” The two girls therefore keep their relationship a secret. One night Mary gets ready for bed by putting on her jammies, brushing her teeth and hair, and getting into bed. In her home under the boards Mouse Mouse is doing the same thing. Both girls call out for their mothers. Nothing happens. The mothers don’t make an appearance, so the two girls go looking for them, calling out “Mom” and “Mommy” as they go. Mary searches the house and asks her father and brother if they know where Mom is. Mouse Mouse searches her home and asks her father and little sister if they know where Mommy is. The girls are starting to get worried. In this delightful story, which began in the book Mary and the Mouse, the Mouse and Mary, we get to go on a simple and yet very surprising adventure with Mary and her friend, Mouse Mouse. Barbara McClintock’s lovely illustrations capture the worlds that the friends live in in great detail, and children will particularly enjoy seeing the illustrations where the human house and the hidden mouse house are shown on the same spread. I am a big believer in recycling, but I have never thought about recycling words, reusing words that someone else has written and re-purposing them so that they become something new and different. This is exactly what the poems in today's book are; they are poems that were created using words that the poets found. It is fascinating to see the ways in which they created poetry out of slogans, advertisements, crossword clues and other pieces of found text. For centuries poets have been inspired by nature’s beauty. They have been inspired by animals and plants. They have told stories and described people. The inspiration for the poems in this book came from an unusual source; they were found. The poets were invited to find their poems within a piece of writing or spoken piece. They saw what they were looking for written on a subway wall, in a book, on a receipt, on websites, advertisements and other sources. They then “refashioned” the words they found (without changing, adding, or rearranging them) to create something completely new. Joyce Sidman found the words for her poem in a Greenpeace calendar. She took the text in the calendar, changed the layout of the sentences and created Song of the Earth, a beautiful poem about our precious natural world. Readers will be surprised when they see what the sources for these poems were. Who knew that catalogs, photo captions, book titles and other everyday pieces of writing could create such splendid poems. Readers might even be tempted to try writing their own found poems. Many of us wish we could have a pet. We image how wonderful it would be to have a cat or a dog who would always be happy to see us and who would eagerly greet us when we came home from school or work. We forget that having a pet is a lot of work. In today's picture book you will meet a delightful little mouse who shows us what it means to be a pet owner. Many people, children and adults alike, sometimes wish that they had a pet. They see someone walking along the street with a sweet dog at their heels, and think how nice it would be to have a dog to walk. Perhaps they see someone sitting on their front porch with a happily purring cat in their lap. How soothing it would be to have a cat like that, a furry purry presence who makes you feel special. In this book a charming little mouse person asks you if you “wish sometimes…that you had a pet?” She then goes on to talk about how important it is that you think about what it means to have a pet. For one thing you have to choose the right one, a pet that won’t be too big to handle, or one that won’t make you have an allergic reaction. Once you have found the right pet, the pet that suits your lifestyle and personality, you have to make sure that you take care of it properly. A pet, even a fish or a roly-poly, takes a lot of work. You need to keep it clean, fed, exercised, and happy. You also have to clean up after your pet’s messes (no matter how nasty they are), and be willing to accept that sometimes pets are “very naughty,” especially if they are bored. In this delightfully sweet and often funny picture book, Maggie Rudy shows people the joys and woes of pet ownership using her cunning little felt mice characters. 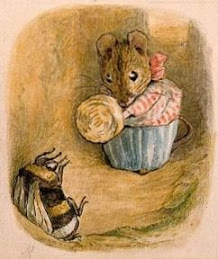 On every spread we see a mouse character or two with bees, fish, beetles, lizards, frogs, and other mouse-sized pets. Backdrops that are mouse perfect present readers with so much to look at, and one almost wishes one could hop into the page and visit the characters in their world. When I was young I spent hours face down (wearing a mask and snorkel) in the Mediterranean Sea watching fish and other creatures go about their business. I also snorkeled in the Indian Ocean, and more recently off the shores of Kauai. There is something magical about watching these beautiful and fascinating animals from the surface, a part of their world and yet apart at the same time. Today's poetry picture book will take readers into that world. The world’s oceans and seas are full of wonderful, beautiful, and sometimes downright bizarre creatures. Some can dive to the deep dark depths, going places that we humans cannot get to unless we are protected by the thick shell of a submarine. Others make their homes in the shallow, warmers waters where the sun dapples the sand and reef. Our next creature is a gentle, slow-moving beast, a starfish that crawls along making the world it lives in all the more beautiful by its five-fingered presence. With beautiful word images and touches of humor, David Elliott shares his obvious love for the natural world with his readers, offering up a celebration of marine animals that is unique and beautiful. When I was in elementary school on the island of Cyprus, we kids had to line up in the playground when break (recess) was over and then we had to quietly walk to our classrooms. The teachers walked at the head of the lines, and I remember thinking many times over that I felt as if I was a baby duck following its mother, or a soldier in formation. How I longed to just run or skip or hop instead of having to walk "quietly." In today's picture book you will meet a goose who cannot seem to walk in step. She, unlike me, wants to be like everyone else, but for some reason she has a hard time fitting in. Igor is a goose who leads his flock to the pond every morning. He insists that all the geese should march in step so that their webbed feet hit the ground “perfectly in synch,” and their rumps waddle “together in time.” No one can remember why the geese do this. All Igor cares about is that their orderly march is “tradition” and tradition matters. Then one day, during the march to the pond, Igor notices that something is amiss. One of the geese is not properly in synch. It turns out that Zita, who recently joined the flock, is having trouble marching in step. Igor tells her that she cannot go to the pond with the flock. She will have to join them later. Sadly Zita goes back to the farm, and then after waiting for a while, she sets off down the road to the pond once more. She cannot understand why she can’t march in step. It isn’t hard to do, and yet Zita cannot seem to manage it. As she walks, crying and sniffing, Zita starts to create a rhythmic pattern tune with her feet, tears, and sniffs, a “Splash, sniff splash and splash again sniff splash” sound. The tune is so catchy that a woodpecker joins in without even realizing it, adding a knocking noise to her song. Raymond the rooster is similarly attracted to Zita’s tune, which he thinks “makes you want to shake your tail feathers!” He too, without making a conscious effort to do so, joins the little goose’s tune with pecks. All too often the world expects us to toe the line and march to a certain drumbeat. Some people are able to do this, but others do not find it easy to do what everyone else is doing. They have their own style and have to go their own way. This wonderful picture book celebrates those who have an independent spirit and who dare to embrace their individuality.